Northborough – Your life can change in an instant. Northborough resident Gayle Kellicker knows firsthand how true that is. 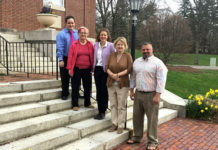 After a work related accident in February, she is now unable to work and has to partly rely on the generosity of others as a client of the Northborough Food Pantry. Kellicker has been divorced for 17 years and has three kids, the youngest a junior in college. She is not a stranger to hard work. She worked a full-time job and three part-time jobs for up to 70 hours a week to make ends meet prior to her accident. Although she is currently receiving workers compensation, it is only a fraction of what her full time salary was and she is currently applying for permanent disability benefits. Co-Director of the Northborough Food Pantry and local Realtor Karen Scopetski said the food pantry currently serves 70-80 families each week. 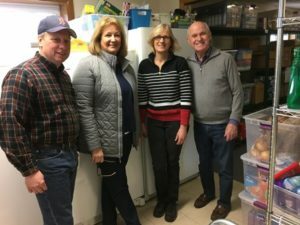 Scopetski said the food pantry is not intended to be used for a full grocery shopping, but as a supplemental source of food for those on a limited income or who have an acute need. One hundred percent of those helped by the Northborough Food Pantry are members of the Northborough community. Although summer might see lower donations in general, the community has always been generous year round. 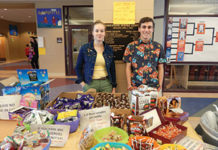 Schools and churches have monthly collections, the Northborough Post Office has a food collection in May, Scouting for Food has its annual food drive in November, and the annual Northborough Turkey Trot raises funds each year. Kellicker is grateful for all the fresh garden produce that is donated during the summer as she tries to make healthy meals and that can be more difficult to do with canned vegetables. Scopetski and Co-Director Dawn Winsor Hines, along with 180 volunteers, work throughout the year to shop for items, stock shelves, clean or pick up donations from the Worcester County Food Bank. Lowe’s Variety & Meat Shop has also been instrumental for the food pantry to purchase meat. The current wish list includes pasta sauces, jelly, shelf stable milk, granola bars, snack crackers, and cereal. The top ten list is posted at http://nfpantry.org/nfp. Donations can be dropped off inside the building during regular business hours. The Northborough Food Pantry is a 501(c)3 nonprofit organization and all donations are tax-deductible. The pantry is located at 37 Pierce St., Northborough. Next articleWinter is approaching… is your home ready?